Morris likes lots of things about school. and singing the loudest during circle time. It reminds him of tigers, the sun and his mother's hair. Morris Micklewhite is a young boy who loves his mom and his cat, Moo. He also loves to dress up at school, but his classmates find this hard to accept. The boys won't let Morris play with them if he's wearing a dress and the girls try to take it off of him saying, "You can't wear it! You're a boy!" Sad from being shunned by his classmates, Morris goes home from school with a tummy ache and stays in bed reading, doing puzzles, and painting a very special picture. The picture he paints helps change his perspective and so when he returns to school on Monday, he decides to build his own spaceship when the boys won't let him play on theirs. 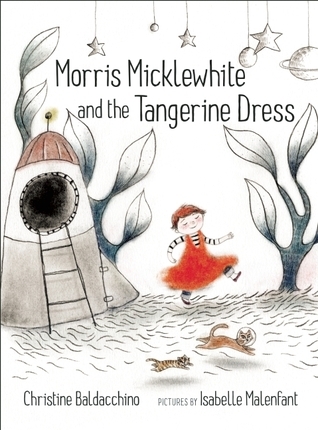 Morris Micklewhite and the Tangerine Dress is a 2015 Stonewall Book Award honor and it is simply brilliant. Not only is it beautifully illustrated, but Morris's positive attitude will make you want to give him a great big hug. It is a heartwarming story about acceptance and challenging gender norms without being overly didactic or political. Not only is this a book I see being discussed a great deal in university children's literature courses, but it's also a story that should be read aloud to children, teens, and adults alike.